07/16/2018　Today, the Canberra Cavalry took a huge step into the massive Asian baseball marketplace by agreeing to enter a strategic partnership with two-time Japanese champions, the Yokohama DeNA BayStars. This is the first strategic partnership between an Australian Baseball League club and a club in Asia's premier baseball competition, and it will see opportunities for both clubs in each other's regions on and off the field from the start of the 2018-19. On the diamond, the BayStars will send affiliated players to Canberra to play for the Cavalry as part of the international import player allotment. The BayStars players will join other imports from current affiliate partners, the San Diego Padres and Toronto Blue Jays of Major League Baseball. The off-field side of the partnership will see the BayStars joining the Canberra Cavalry front office in the future. These positions with the Cavalry are expected to be highly sought-after by the BayStars as it will give them an unparalleled opportunity to gain international work experience. The staff will bring to the Cavalry a new level of experience from one of the world's premier sporting leagues, which will flow on to an improved game day experience for players and fans. This unprecedented level of cooperation between the ABL and NPB clubs has not happened overnight, and did not come into being lightly. Representatives of the DeNA BayStars visited Australia in late 2017, attending several ABL games. They were impressed with what they saw in the national capital and chose the Cavalry for this historic partnership. 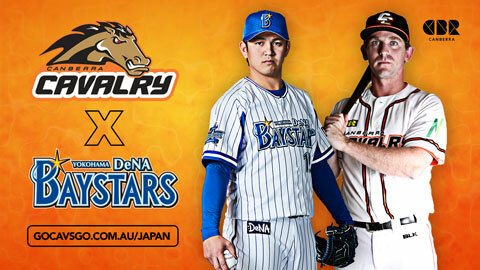 DeNA BayStars president Mr. Shingo Okamura sees great potential in the partnership, stating: "We are very pleased to have concluded a strategic partnership with ABL's powerhouse Canberra Cavalry. Australia is located in the southern hemisphere and is in an optimum environment for the players development in Japan's off-season. I expect the players to gain a lot of experience in Australia, which will bring new value to the DeNA Baystars. We are also planning business and baseball operations personnel exchanges. Through this partnership, we will continue making efforts to become an attractive club from a business perspective." Another point in the Cavalry's favour was the redevelopment now underway at MIT Ballpark in Narrabundah. Canberra Cavalry General Manager Dan Amodio was delighted by the Japanese club's enthusiasm for the project. "While the DeNA representatives were only able to view our preliminary construction plans, it was easy for them to see that MIT Ballpark would become the best venue in the country for their players." "The ACT Government's $5 million renovations to The Fort at MIT Ballpark also means that Yokohama fans will be treated to the best backdrop in the league, as they watch their players on their Australian assignments, with all Cavalry games to be streamed live in the 2018-19 season. The redevelopment at MIT Ballpark helped to make this partnership possible because we can now offer world-class facilities to a world-class organisation like the BayStars" he said. Cavalry CEO Donn McMichael is excited about the commercial and spectator opportunities the club will benefit from. "Canberra will be the first ABL team to actively and directly target Japan as an overseas market. Other ABL teams have previously seen large spectator interest in Korea and Taiwan when only a couple of players from those countries have played there. We're entering into a formal partnership, whereby the BayStars and Cavalry will be part of the same family. And given the fanatical levels of interest for the game in Japan, we expect there will be massive increases in the streaming audiences. We will introduce dedicated membership offerings to welcome BayStars Supporters, which will give their fans in Japan special items so they can show their support during the NPB off-season." The Canberra Cavalry will also be in a strong position to offer sponsors, both existing and new, large amounts of international exposure via the game-day live streaming product, several other digital platforms, and social media channels, which will all experience exponential audience growth. The partnership will also provide an inside track for Cavalry players looking for experience in Japan, as they will have the opportunity to gain exposure within the BayStars organisation. This connection will prove especially important for Cavalry players aspiring to play for Team Australia at the Tokyo Games in 2020 as Yokohama Stadium, the home of the BayStars, will be an Olympic baseball venue. Yokohama Stadium is currently under renovation and will have a capacity of 35,000 people by 2020.